Well, after 2 and a half years I have finally finished up my Sampler Quilt! This was one of the projects I started before I found all of the fab online shops, so a few of the fabric choices are not necessarily to my current tastes, but now it's finished with a riot of polka dots (my faves as I may well have mentioned before!) and stripes, I rather like it. The blocks are from the 2012 Craftsy block of the month, and I think there are a couple of months missing, when I ran out of steam towards the end of the year! This was always intended to be a sofa quilt for me, so finally after 3 and a half years of quilting I have my own quilt- not that I need it at the moment as it has been sweltering in the UK for the past few weeks and I feel like I am about to melt! For quilting, I have added my trademark "light touch quilting" (anyone who suggests I'm a lazy quilter who doesn't like the actual quilting process may well have a point, but I can't guarantee I wont smother them!!!) with a cross hatch across the blocks both ways, and then a little straight lining around the blocks. Overall it's come up as a respectable 55 inches/140cm square, just perfect for me to snuggle under this winter. This is the first quilt I've actually backed with the Britten Nummers fabric from Ikea, but I rather like it, and it seems just perfect for this Monochrome Sample quilt, first tick off of the list, yay! I am now turning my attention to some of my other WIP's, and decided rather cleverly (in my humble opinion) to combine a couple, and to get some of the additional blocks made up for my month (August) as Queen Bee for Stitch Tease. Those with a long memory, may remember the plus blocks I started last year, with the aim of making a Super King Size quilt (apologies for the murky pic). Well I was contemplating how to increase their numbers significantly, when I remembered the New York Beauty Circle of Flying Geese block I made recently, and decided it could be the centrepiece of the quilt, genius! Sorry, I couldn't help myself, I had to throw a few more photos in, I adore this block, can you tell? That is a great idea to combine the two. Love the dotty sashing and the stripe binding on your B&W sampler, it really finishes it off. I have a few metres of the nummers fabric too but I don't know if I like it- it seems a bit see-through to me so I might end up swapping it out at some point. Can't knock the price of it though and it's less ugly than my usual charity and vintage shop eclecticness. 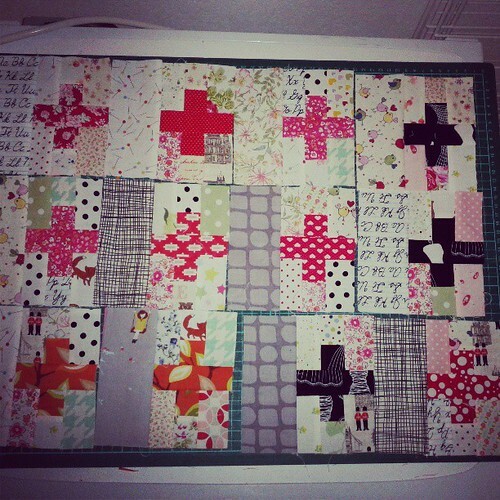 lovely work, especially the NYB block - it's divine! One day I am going to make that NYB, the pattern has been on my computer for months...akways good to have a finish no matter what the time frame is. All looking rather fab missus! The New York Beauty top is awesome. I'm laughing at the image if Susan thinking she had to piece one for you. I'd pass on it too, and be kicked out of the bee. Great idea to kill two birds with one stone.